Successfully Added MP4 Bluetooth Watch (4GB) with Bluetooth Headphone to your Shopping Cart. MP4 Bluetooth Watch with Wireless Bluetooth Headphones. A refreshingly fun MP4 watch with a high quality color TFT screen, for you to enjoy your favorite digital media in style. Featuring embedded Bluetooth technology, this lively MP4 watch offers the full convenience of wireless connectivity in a compact, attractive form factor. With the supplied Bluetooth headset, enjoy the flexibility of staying connected in style. Responsive and easy to use with a user-friendly interface, you will always be in control of the powerful multimedia features. This funky digital multimedia player would be perfect for those with busy, active lifestyles who want the freedom to carry and enjoy their digital media at all times. 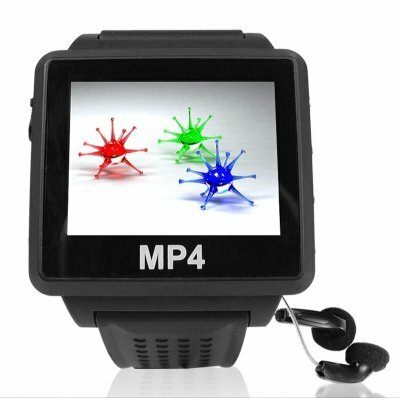 This powerful MP4 watch has something for everyone, it would be a great gift for those who like to enjoy the flexibility of multimedia whenever they want. Relax and unwind in comfort at your own leisure, in your own time. Take advantage of the spacious 4GB capacity and carry your favorite music and movies everywhere with you. Wherever you go, wherever you are, this stylish MP4 watch gives you the freedom and convenience to enjoy your digital media while on the move. Watch your favorite movies, listen to your favorite music or simply enjoy your photos - the choice is yours! Play digital videos or music on your watch!